Editor/Author Bard, Allen J., Stratmann, Martin and Scholz, Fritz, et. al. From fundamental research to its application in the industry, this encyclopedia covers all aspects of electrochemistry. It provides both a comprehensive overview for electrochemists and an accessible look at electrochemical topics for users from other scientific disciplines. 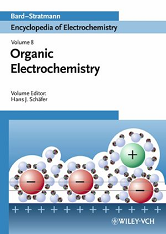 Volume 8 in this series offers a detailed examination of organic electrochemistry.